“This project is a real childhood dream come true. I feel extremely privileged to have immortalized this ideal collaboration with Maestro Nagano and to now be part of the rich discography of the OSM” says Charles Richard-Hamelin of this album recorded in concert at the Maison symphonique de Montréal in October 2018. Silver medalist and laureate of the Krystian Zimerman Prize at the 2015 International Chopin Piano Competition in Warsaw, Charles Richard-Hamelin impresses with his extremely refined playing and absolute musicality. The OSM and Maestro Nagano offer an emotionally contagious world-class performance that is in perfect harmony with the soloist. 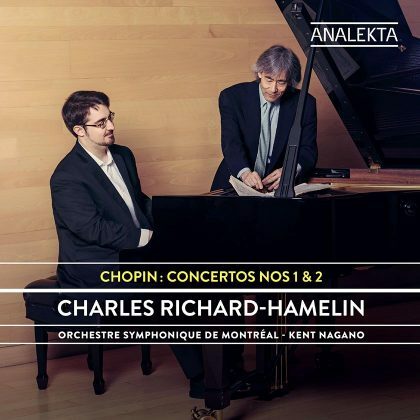 “It was with heart and discipline that each musician and artisan engaged with this adventurous project.I applaud the extraordinary work of solo pianist Charles Richard-Hamelin, whose bravura gave us two concertos in a single concert. A unique example of artistic and human collaboration, the the result reflects remarkable fluidity and beauty ” tells us Kent Nagano, Musical Director of the OSM. Pianist Charles Richard-Hamelin stands out as one of the most important musicians of his generation. He has appeared in various prestigious festivals including La Roque d’Anthéron in France, the Prague Spring Festival, the “Chopin and his Europe” Festival in Warsaw and the Lanaudière Festival in Canada. As a soloist, he has performed with more than fifty ensembles including the main symphony orchestras of Canada as well as with the Warsaw Philharmonic, Sinfonia Varsovia, Tokyo Metropolita Symphony Orchestra, Singapore Symphony Orchestra, the Korean Symphony Orchestra, OFUNAM (Mexico), Les Violons du Roy and I Musici de Montréal. His albums have received widespread acclaim from critics throughout the world, including those of prestigious magazines such as Diapason, BBC Music Magazine and Gramophone.